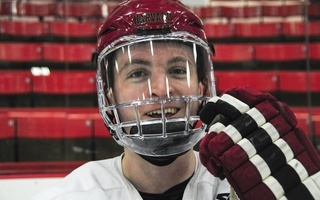 For most of its late season surge, the Harvard men’s hockey team (10-19-3, 6-14-2 ECAC) has mainly relied on its senior class, a talented group of veterans looking to salvage its last season with the Crimson after a slow start. 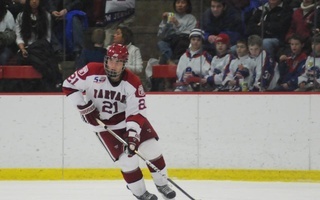 But on Friday night in the opening game of the ECAC playoffs at Thompson Arena, the rookies stole the show, netting two goals and propelling Harvard to a 2-1 upset victory over Dartmouth to gain a 1-0 lead in the best-of-three series in the first-round of the ECAC conference tournament. The Crimson jumped in front with the first goal of the game in the second period from freshman defenseman Desmond Bergin, but the Big Green (15-12-5, 9-9-4 ECAC) came back midway through the third to knot the score at one. The score stayed that way until just under three minutes remained in the contest. After a series of passes from freshman Kyle Criscuolo and senior Marshall Everson, freshman Brian Hart fired a shot at the Dartmouth net. Initially blocked by Big Green goalie Cab Morris, Hart followed up on his shot, collected his own rebound and found the back of the net. The Crimson was able to withstand Dartmouth’s final empty-net push, with junior netminder Raphael Girard coming up with several of his 39 saves on the night in front of the Harvard net. The Crimson is 4-0 when capturing the first game of the first-round series, last winning in 2011 when it upset Clarkson in a similar late-season run. 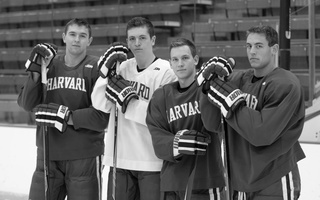 But in that same season the Big Green was able to come back after falling in the first game of the quarterfinal series against Harvard. Friday night’s game marks Bergin’s first appearance since injuring his ankle back on Jan. 12 against Dartmouth in Thompson Arena. He made his presence felt immediately with his second period goal, his second of the season. Freshman forward Greg Gozzo passed the puck back up along the right boards to junior defenseman Danny Fick, who then sent a pass along the blue line to Bergin waiting at the left point. Bergin collected the puck and fired a slapshot through traffic and into the net. 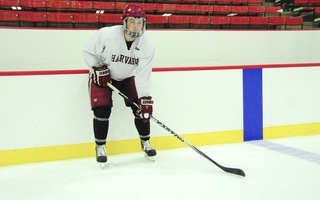 Dartmouth responded with a goal from Jesse Beamish, who netted the game-winner against the Crimson in the January contest. Tim O’Brien and Charlie Mosey were attributed with assists on the play. Hart’s game-winner at 17:15 in the third was his fifth of the season and 18th point of the year, now tied with Ivy League Rookie of the Year Jimmy Vesey for second on the team in points, one behind assistant captain Alex Fallstrom. The goal came on a counter attack, with the Big Green rush initially broken up by Everson. Criscuolo found the puck, made a short pass back to Everson, who then bounced the puck off the left boards to Hart near the blue line. Hart skated up along the left side, fired a wrist shot at Morris and then capitalized on his second chance on the rebound. —Staff writer David A. Mazza can be reached at damazza@college.harvard.edu. Harvard has now denied its opponent on 29 of 31 man-up chances (94 percent), the fourth-best rate in the country.